This article submitted by Linda Stelling on 3/24/98. Directly affected by the changing status of midwives are John and Heidi Riley, Paynesville. They had their first child at home with Erickson as their midwife. Their second child is due in April and will be born at the Paynesville Area Hospital. Heidi has been seeing Dr. Sult for her prenatal checkups. “At each checkup, I keep asking if it wouldn’t be possible to have the baby at home,” she said. Dr. Sult has indicated he would try and make this birth as close to a home birth as possible in the confines of the hospital. 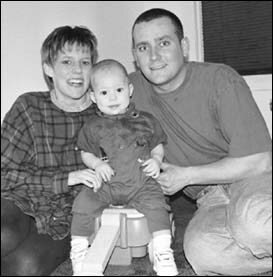 Several other couples in the area have experienced home births. Among them are Brent and Vicki Lahr, rural Eden Valley; Tony and Kim Flanigan, Paynesville; and Dave Pederson and Ruth Fairchild, Spicer. The Lahrs delivered both of their children, Jordan, 5 and Baylee, 3, at home. “We read a lot of literature and were convinced home births were natural and safe,” Vicki and Brent said. “My midwife, Laura Erickson, helped me understand what my body was doing and the changes tha would take place and to believe I could get through this emotionally,” Vicki said. “There is something very comforting about being at home. We can walk around when you want to, visit with friends if you wanted to,” Vicki said. The couple feels parents should have the right to have their babies born at home. Tony and Kim Flanigan, who have had two of their five children delivered at home, said they wouldn’t go back to a hospital again after having a home birth. “I felt such an inner strength after having Chloe at home. I felt on top of the world. It was empowering. I felt great as I did it on my own with a midwife,” Kim said. “The bonding afterward was important. The siblings bonded right away with their new brother and sister. We never had the rivalry because the new member was always there, not this stranger brought home from a hospital,” Kim said. Ruth Fairchild and Dave Pederson also had two children born at home. Marie was born in Vermont and Eben was a water birth at their home in Spicer. “We had done a lot of reading about home births and found they were just as safe or safer than a hospital birth. I just seemed the reasonable thing to do,” Ruth said. “The only risk factor was my age and we didn’t consider that a risk.” Ruth was 38 when she had her first child.